If you haven’t noticed from our previous restaurant posts, we LOVE pork belly, that’s why it’s a must order when we dine out. 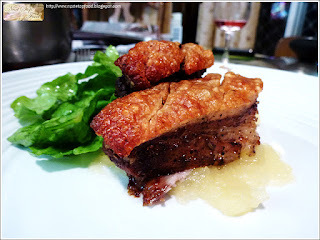 So when I invited the girls over for dinner after the Good Food and Wine Show (GFWS), making pork belly was the first thing that sprung to my mind. This was the first time I’ve attempted to make it and to be honest, I was a bit scared that it will be disastrous and we will end up having take out for dinner. But I still got the pork belly in the morning, and quickly cleaned it and pat dried it. Then I pan fried my spices then let it cool before grinding it with a mortar and pestle. During the cooling period, I scored my pork belly and by the time I finished scoring, the spices were ready to be grinded. I rubbed the spices onto the flesh and the salt on skin. Then I put the pork into a freezer bag and put into the fridge, quickly put on some make up and head out to the GFWS. By the time we got home from the show, the pork was in the fridge for a good 5 hours, so I guess the salt did its trick and absorbed moisture from the skin and created a beautiful crackling that sounded like biting onto a crunchy Italian biscotti – SUCCESS! I thought making pork belly would be really difficult, but this masterchef recipe was quite easy to follow. I did a few things different from the original recipe; I used pink lady instead of granny smith simply because I didn’t have granny smiths at home. Also I didn’t make the glaze that was in the recipe but it still tasted scrumptious. For the salad, I used the Yumm’s thai zing dressing we bought from the Show with oak lettuce. I hope your pork belly will turn out perfect like mine! 2. For roast pork belly, trim pork of excess fat and score the skin. In a dry pan roast the fennel seeds, one tablespoon salt and the peppercorns until fragrant. Cool, then grind finely in a pestle and mortar. Rub all over the flesh side of the pork, massaging it in well. Sprinkle skin with about one tablespoon salt and rub in. Refrigerate for at least 30 minutes. Remove from fridge, wipe of all salt and moisture. Lightly salt. Place pork on a roasting rack with a tray of water underneath to help keep the pork moist. Roast for 2 hours or until skin is crisp and flesh is tender. Check after 45 minutes to ensure the pork crackling doesn’t burn. If it’s looking a little too brown cover the pork with foil, or reduce oven temperature to 200°C. Rest for 20 minutes and cut into rectangular serving portions. 3. For apple puree, place apples in a saucepan with lime juice, sugar and 1-2 tablespoons of water. Cover and simmer until tender. Blend in a thermomix or blender until smooth. Check for seasoning. 4. To serve, place pork on a serving plate. Add a dollop of apple puree next to pork. Add lettuce and lightly dress with thai zing.